Since its inception as a state, Russia has been both a European and an Asian power. Although Russia today, as was true during much of its history, is torn by an identity crisis over where it belongs, its elites have never renounced Russia's vital interests in Asia and the belief that it should be recognized as a great power there. 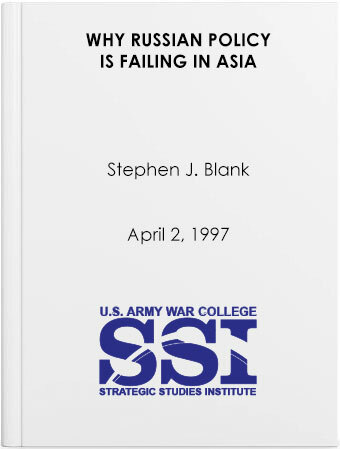 However, that belief and Moscow's ability to sustain it are now under threat, due, as Dr. Stephen Blank's thorough analysis informs us, to the ongoing failures of Russian policymakers to come to grips with changed Russian and Asian realities. At the same time, this aspect of Russian policy has been neglected in American assessments of Russia. This is a serious shortcoming, because, in Dr. Blank's view, Russia's Asian policies, viewed in their full breadth, are important signs of present and future trends concerning its behavior at home and in the wider world. Those policies are also significant as Asia's importance in world affairs rises. We ignore the threatening situation facing Russia, and Moscow's failure to adjust to those threats, only at our own peril. The growing concern over Russian arms transfers to China, a subject addressed in the study, is only one sign of unexpected negative trends that might work against U.S. interests if we continue to neglect Asian aspects of Russia's global behavior and policy.